I caught Edward Kleinbard the other morning on Cspan. He is a professor of law and business at USC and a fellow at the Century Foundation. His book: We are better than this: How Government Should Spend our Money. If you google his name, articles will come up from October 2014. It attracted my attention because of my thinking as expressed in my article back in February of 2013. The rest of the dinner table deficit/debt discussion: Equity His thesis is that we need to be spending more as it is investment that creates the capital needed to grow the nation. Focusing just from the view summed up in the phrase “tax and spend” misses what government is about. Government doesn’t tax, government “principally spends money” via investment and insurance. Spending should be complimentary to the private sector. When government “invests” the pie gets bigger not smaller. He worked on Wall Street for “many decades” also. How he kept his humanity as you will hear in the presentation while being on Wall Street…? Let me start though with this short video as it is another business person like me who appears to get my posts regarding what is needed in this country to go along with the equity spending. I first mentioned this position in 2010 regarding the SOTU address. Here we are 2015 and we small business people are still saying the same thing. Professor Kleinbard addresses small business too as part of understanding the overall condition and needs. I give you Dave Boris, owner of Hel’s Kitchen Catering. This is more or less relevant to Beverly’s post from earlier today. How many times have you heard Boehner, McConnell, Ryan or one of the legion of right-wing talking heads say, “We don’t have a revenue problem, we have a spending problem?” I refuted that lie repeatedly in this AB post and at the included links. But this is one of those zombie ideas that simply will not stay in the grave. Therefore, some prominent voices have found it necessary to sing out again against the lie. I will add my humble quavery baritone to the chorus. 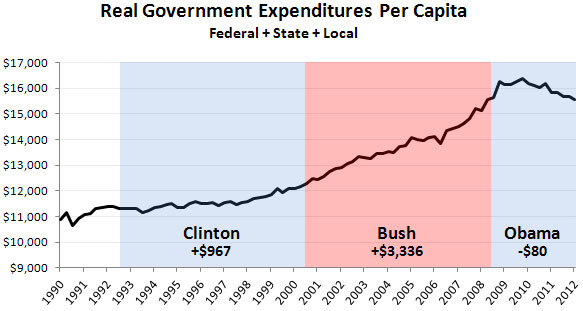 Here in Graph 1 is Kevin Drum demonstrating how Real Government Expenditures per Capita have changed under the last three presidents. What we have isn’t a spending problem. That’s under control. What we have is a problem with Republicans not wanting to pay the bills they themselves were largely responsible for running up. By using real [inflation adjusted] and per capita numbers, Drum has introduced a couple of denominators. Real expenses per cap is a rational way to display the data, but not the only way. So lest someone cry out about that ol’ devil denominator, let’s have a different look. Via Paul Krugman we get Graph 2 and Graph 3, from FRED, showing total Government expenditures and Federal Government expenditures, respectively, on log scales. Yes, you can argue that spending was growing too fast under Bush, although it’s funny how few deficit scolds saw fit to mention that at the time. Or you can say that you just want less spending, although as always people who say this tend to be short on specifics. But the narrative that says that spending has surged under Obama is just wrong – what we’ve actually seen is a slowdown at exactly the time when, for macroeconomic reasons, we should have been spending more. Remember, a log scale represents constant growth as a straight line, and zero growth as a horizontal line. So, in pure dollar numbers, spending hasn’t quite declined, but it has stagnated to almost zero growth. Hence Drum’s decline in inflation adjusted, per capita terms. In Graph 4, we get one more longer range look, using Krugman’s data series, this time on a linear scale. Also presented is the difference between the two, which is the amount of spending by state and local governments. To bring things full circle, Graph 5 shows Federal Government current receipts. Look at this and tell me we don’t have a revenue problem. To drive this point home, Graph 6 shows Federal Receipts as a fraction of GDP. The purpose of the ratio is to provide context, using GDP as a proxy for the size of the economy. As you can see, revenues/GDP are in a historically low range. – Federal spending is flat in nominal dollar terms. 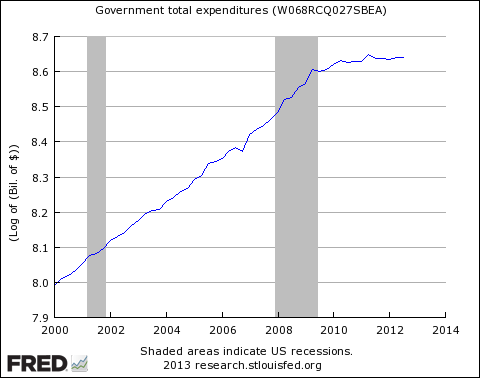 – Federal spending is declining when adjusted for inflation and population growth. – Federal revenues are far below trend lines based on any historical reference you chose. – Federal revenues as a fraction of GDP are historically low. – The Republican claim that we have a spending problem not a revenue problem is simply a lie, on both counts. – Disproportional spending growth has only occurred under two presidents: Republicans Ronald Reagan and George W. Bush. The simple fact is we have a revenue problem, not a spending problem. The truth is hostile to their agenda. PK Explains. Over at Plain Blog, an anonymous wing nut made this off-topic comment. Now, yes, Bill Clinton and his 2000 federal spending level of 18% of GDP doesn’t put him on the fringe, which makes it surprising that you lefties are celebrating him, even as you hysterically condemn anybody who resists the Left’s current massive spending levels, which are nearly 50% greater than Clinton’s and are spending the nation into debt obvlivion. This once again raises the regressive canard that Obama has been a profligate and fiscally irresponsible spender. Here is a graph of current expenditures that took place in the years of the current century. First observation is that anon’s math isn’t very good. Current expenditures are roughly 100% greater than when Clinton left office, not a mere 50%. Second observation is that the vast majority of that increase – from about $1900 billion to about $3200 billion – took place under the previous administration. Third observation is that the bulk of the Obama increase occurred during the recession – as it should – from a bit under $3200 billion to a bit under $3600 billion. Since then it’s crept up to about $3800 billion, and has recently flat-lined. A more subtle point is that spending, like many time series data sets, increases exponentially over time, following population growth. So, saying that a value at time B is some percentage greater than the value at time A communicates essentially zero information. Context matters. Let’s look at expenditures in terms of year over year increase. Yep, there was a big increase in 2009 and 2010, as social safety net programs kicked in. Since then, expenditure growth fell precipitously and now has actually gone negative. The last time that happened was in the Eisenhower administration. Clearly, Obama has not been profligate. Would it be an exaggeration to say he’s been miserly? Bill Clinton did a great job of exposing Republican lies in his speech at the Democratic convention last night. But really, it’s easy. All you have to do to refute a regressive is have a quick look at facts and data. The Atlantic Wire (via @NoBigGovDuh) has a great story on the dishonesty of Mitt Romney’s “You didn’t build that” ads. It turns out that at the Republican convention on Tuesday night, they plan to ramp it up again with a speech by a small business owner from Delaware, Sher Valenzuela, telling everyone how she did build it, not government. Only one small problem. Actually, two. First, Valenzuela’s business, First State Manufacturing, “received more than $2 million in federal loans and more than $15 million in federal contracts over the years,” according to the article. This included Small Business Administration money very early on, as well as federal disaster relief loans after 9/11 and loans from the American Recovery and Reinvestment Act. So, beyond the fact that she obviously didn’t build the roads and bridges and other infrastructure–which the President was actually referring to in his speech Romney has so grossly twisted in his ads–she benefited mightily from more direct government aid. Even a month ago, we knew that lots of companies Romney promoted with this tagline actually had gotten direct government support, too. First State Manufacturing is proud of our heritage, and thankful for the help that government has given us along the way. Not to mention the current help government provides! We believe that to say otherwise would be ungrateful, hypocritical, and unpatriotic. We’ll see on Tuesday night. UPDATE: Here is something from Valenzuela’s own website: “Get federal dollars by being a minority-owned business.” Hypocrisy, anyone? Welfare, I’m not hurting from it and neither are you. A good friend and I got into an email debate. He sent me the latest message regarding how wonderful it is that Florida is going to be drug testing welfare recipients. I responded that I’ll consider the policy when we start testing all the CEO’s who get welfare for their sector of the economy, the lawyers, judges and all country club members. I also noted welfare is not the problem He noted it’s not “the” problem, but it is “a” problem and he knows this from talking to people. I know of welfare too. I have served on two nonprofit boards, one for substance abuse and the other The Providence Center. My family adopted a family when I was in junior high. We had foster children. I was a day counselor for 2 weeks in the summer of ’73 for 7 to 12 year olds from 3 of the most horrible housing developments in the city of Providence. We had the “Institute” literally right around the corner from where I lived. My daughter is doing a year with NeighborWorks America. Welfare is not the problem. But, my friend is a very smart person and an engineer, so I needed some numbers. Using this site I checked out what the ratio of spending on Family and Children and Housing is to our GDP. I used GDP and not the overall budget because hey, we all worked to earn that money and it might as well be used for something that is heart warming. The following numbers are total national spending (Fed, State, Local). The year 1962 is the first year that there is spending listed for both Family and Children and Housing. Prior to that only Housing is listed as having spending. For 1962, the combined total ratio was 0.0027. That is 0.27% of our GDP was spend on families, children and housing. I started with 1970 and went forward using the endings of the presidential terms starting with 1980. First of all, these are miniscule percentages of our GDP. Second, it sure looks to me like the best way to solve the “welfare problem” is to solve the economic problem. Of course, this means nothing if we don’t have other government spending patterns to compare too. I mean, how do we know if welfare is “out of control” if we can’t compare it to other spending? The same data set has two other categories: General Government and Other Spending. You can click on each to see the sub categories. But, just so you know General Government consists of Executive and Legislative organ, Financial and General services. Other does not include: Pensions, Education, Health, Defense, Protection, Transportation or interest. Other is just that: Other. Here is how the numbers look. This is how the numbers flow as log function. Call me stupid, but it looks to me like what we spend on welfare is not much more than what the government is spending on just doing the government thingy, unless of course people can’t get a job. Interestingly enough, the share of GDP spent on welfare in 1992 and 2010 is the same. In fact, at the peak of unemployment of the 2001 recession which was 2003, we spent just 0.0098 on welfare. Here is another comparison. In 2009 we spent $167 billion on Family/Children and Housing. That year, we also spent $161 billion in the Other category of “Economic Affairs”. I don’t know what that is, but if it has anything to do with what we are experiencing I don’t think we got our money’s worth. This item went from -7.0 in 1997 to 7.8 in 2002 to 17.5 in 2005 to 1.3 in 2007 back to 17.7 in 2008. It landed at -79.7 in 2010. Hummmmmmmmm. I think Glen Beck would like this category. You know, who’s been playing with the money in the cookie jar? In fact, why did we not know that a cookie jar exists? you believe is a problem? You know those drug addled lazy moochers who are preventing all us moral and hardworking folks from living the good life of our congress persons. Be careful now. This is a trick question. See, it won’t take much of a “problem” subtracted from what we spend to find ourselves spending less to take care of families and their children than we spend on the top office operations in this nation. That’s just plain being cheap. Down right, out and out cheap SOB’s even if we leave in all of the “problem”. If these words translate to actions in the Congress on emergency aid, I believe it is a significant departure from past policies. And Virginia, Cantor’s home state, is predicted to be impacted. We will know soon enough if political capital is spent on this idea. A spokesperson for House Majority Leader Eric Cantor (R-VA) said that if there is any damage caused by Hurricane Irene requiring federal disaster funding, the money would have to be balanced out by spending cuts elsewhere in government. Right-wing economists love to claim that government spending “crowds out” private spending, especially investment spending on fixed assets. It’s probably true at some level and in some situations. But if it was true for postwar America, you’d expect to see some evidence in the historical data, right? Note: Government includes all levels — federal, state, and local. 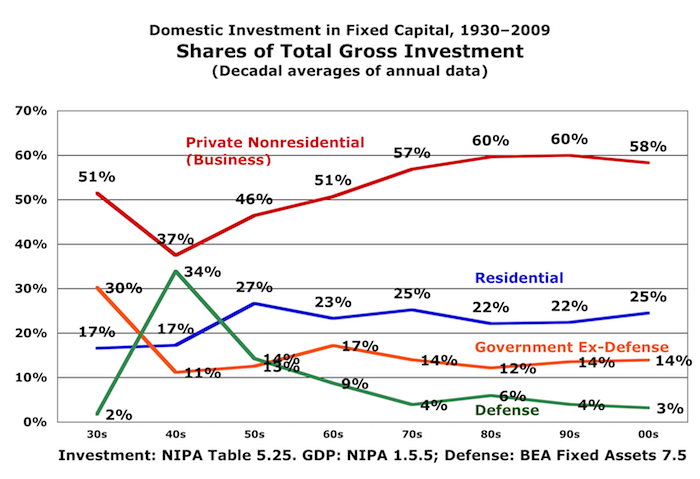 The investment share of government, ex-defense, fell by 29% from the 60s to the 80s, while the share devoted to business increased 18% (28% from the 50s to the 80s) — the very period when the blossoming New Deal programs and Johnson’s Great Society were supposedly creating Leviathan, embodied. Those changes in share percentages don’t really put across the magnitude of the change, though. Business investment started at a much higher level, so the absolute increase in business investment utterly dwarfs all the other changes. Curiously (given the right-wing narrative) the business share flattened out once we started feeling the manifestly salutary effects of the Reaganomics world view. It actually declined slightly under Dubya and six years of unfettered Republican control. Go figure. Defense investment has plummeted since the 50s (and — naturally — the 40s) — a 31% decline in its share from the 60s to the 80s, 58% from the 50s to the 80s, and 78% from the 50s to the 00s. Wondering what caused Tyler Cowen’s Great Stagnation (the slowdown in economic growth since the mid-70s)? Here’s what looks like a smoking gun: Government investment spending as a percent of GDP fell off a cliff from the 50s/60s to the 80s — a 42% drop in sixteen years from ’68 to ’84, down 48% from ’58 to ’84. It’s been floating around that low level for the last 26 years. Oh and for those who are curious, government consumption spending as a percent of GDP has been flat since the mid-70s. The crowding-out theory of postwar America is in fact anachronistic by about six decades. When Simon Kuznets (who in the early thirties created the system of national accounts now used by every country in the world) published Capital in the American Economy in 1961, reviewing trends from 1869 to 1955, he cited the proportional growth of government investment as the dominant trend in capital formation over the decades he was examining. The postwar trend has been in exactly the opposite direction. I’m just sayin’: stopped clocks are wrong most of the time. (h/t MG) The original documents from the House Committee on Appropriations are located here. These include the legislation text, legislation summary, and the program cuts. The legislation summary provides a breakdown of spending authority. Don’t savings lower the deficit? Both ideas officially “score” as savings that could be used to pay for spending elsewhere in the day-to-day budgets of domestic agencies. But they have little impact, if any, on the deficit. OMB Watch reports here and here on the Transparency Through Technology: Evaluating Federal Open-Government Initiatives : Transparency Through Technology: Evaluating Federal Open-Government Initiatives and testimony here. OMB Watch recommends six changes Congress and the Obama administration should make to USAspending.gov, the government’s spending website which is based off of one of their websites, FedSpending.org. Unique entity identification: Create a new system to link recipients to lobbying data, contractor performance information, etc. In the midst of a fight about the budget deficit, Congress is poised to shut down federal websites that tell the public how the government spends our money. It’s ironic and disappointing. Websites like USAspending.gov and Data.gov have started to make government more transparent. But just when things are starting to get better, Congress wants to take us backward. Members of Congress love to talk about transparency, but the spending bill being negotiated right now would slash funding for vital transparency programs by 94 percent. Agencies are already making contingency plans to shut down the sites if their funding is cut so drastically. Congress is set to vote on the budget this week. Incredibly, Congress wants to cut the Electronic Government Fund even though it represents only 0.002 percent of the deficit. But this tiny slice of the budget pays big dividends: sites like USAspending.gov help citizens and government watchdogs spot wasteful spending and other abuses – and deter them from happening in the first place. We can’t afford to not know how our money is being spent. Meanwhile, Congress hasn’t held a single hearing to debate the destructive impact these cuts would have on government openness.